THE biggest shock for Peter Reznikov on his arrival in Wales wasn’t the absence of queues outside shops or the abundance of foodstulfs inside them. For the Russian interpreter from Rostov, who is teaching at Eirias High School, Colwyn Bay twice a week, the greatest surprise was to see bouncers outside nightclubs on Saturday nights. For a young man whose country has just undergone the most momentous changes since the revolution in 1917 this may seem a an unusual observation. But Peter Reznikov, who is staving at The Continental, 10 Seabank Road, Colwyn Bay, after joining the staff at Bodelwyddan TVEI Centre, is here to discover the real Britain, the real people and the real social life. With warnings from his mother to be careful in the Wild West’ and not to drink ti» i much, drive to fast or stay out all night. Peter arrived in Wales this Autumn. One thing led to another and he found himself hired as a teacher of Russian languaf,» and Soviet affairs in five Clwyd schools. “Moscow is full of American businessmen and if you’re not careful you end up speaking with an American accent.” said Peter who has studied English for 11 years. “I don’t think you had better write that in your newspaper,” he laughed and would only say that we are known as a nation of lazy linguists. 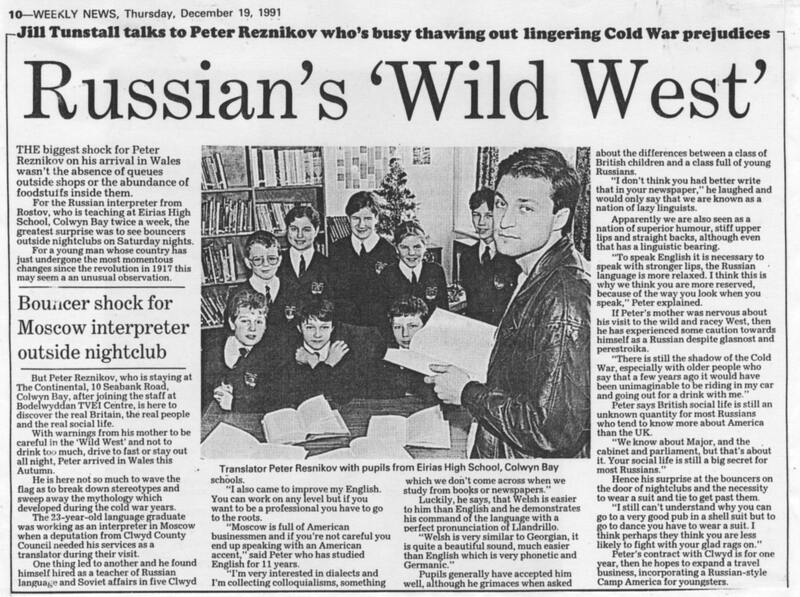 If Peters mother was nervous about his visit to the wild and racey West, then he has experienced some caution towards himself as a Russian despite glasnost and perestroika. Peter says British social life is still an unknown quantity for most Russians who tend to know more about America than the UK. “I still can’t understand why you can go to a very good pub in a shell suit but to go to dance you have to wear a suit. I think they think perhaps they think you are 1 likely to fight with your glad rags Peter’s contract with Clwyd Is year, then he hopes to expand a travel business, incorporating a Russian-style Camp America for youngsters.